This summer, Albion College’s equestrian program hired a new western coach, Adam D’Agostino. With D’Agostino now at the reigns, big goals are in place for both the equestrian program and the western team. For the short-term, D’Agostino plans on getting the western team to Regionals this year and tidying up the horse herd at the center to maximize performance. Within the coming years, he plans on bringing the team to Nationals and continuing to strengthen the team of horses at the Equestrian Center. D’Agostino has a background with horses, business management and western coaching. Originally from Syracuse, New York, D’Agostino began riding around the age of 13 and fell in love with horsemanship. He started off with barrel racing — a rodeo event where horse and rider race around barrels — and 4-H shows. He then went to the University of Findlay, for its well-known equestrian program for western riding and horse business management. During his time there, D’Agostino rode for both the varsity western team and the varsity hunt seat team and garnered victories at the National Intercollegiate Horse Shows Association (IHSA) show, and won in 2007. He graduated from Findlay with a master’s in both western coaching and business administration. He then began his coaching career at Cazenovia College in Cazenovia, New York. D’Agostino was Casenovia’s the western coach for seven years. He also taught their western horsemanship program. He brought their western team to the National IHSA show for the first time in over a decade. In 2009, D’Agostino started his own professional business, Empire Performance Horses, with Paint and Quarter Horses. Empire Performance Horses is still in operation and focuses on buying and selling Paint and Quarter Horses for clientele and training horses in specific disciplines. 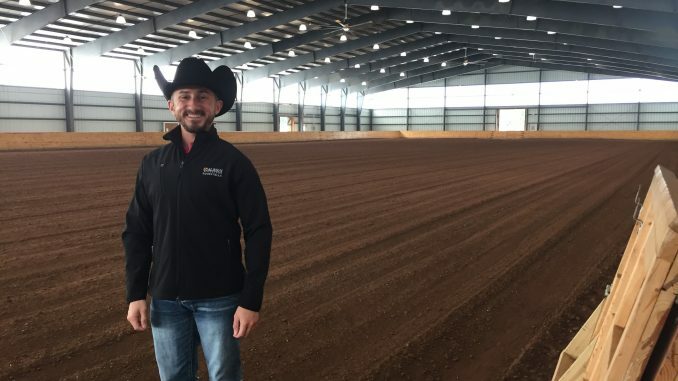 In his private business, D’Agostino also coached western riders, bringing some to the World Show after they won the National Show, the National Reining Horse Association derby, and has had a national champion in the reigning division. In 2015, he joined the IHSA as a national western steward, which allowed him to see the best horses and riders in the nation. Now at Albion, D’Agostino has specific success-driven goals in mind for the western team and the equestrian center. “I need to get this house in order. Stripping down to the basics is just my primary goal and just trying to figure out why this team isn’t winning,” said D’Agostino. He has revamped the horse herd at the Equestrian Center, meaning he gave back some horses to their donors and has brought in some of his own horses from Empire Performance Horses. D’Agostino intends to bring some of his horses to the IHSA National Show in Syracuse this year just to get the riders on the western team used to the national show setting and to see what the inner workings of a national show is like. Riders who qualify for the National Show use someone else’s horse; D’Agostino wants to bring his horses in. He also hopes to win the region this year, and at least start to get the western team in the national’s conversation within the next few years. Albion’s western team is in Zone 6, Region 4 which has 16 teams competing in it, including Grand Valley State University and Michigan State University. “I think we have a strong shot, we have a really strong team. I am so impressed with my 18 individuals, so I really can’t wait to see what they do in the ring,” said D’Agostino. D’Agostino said he is very excited to be immersed in the Albion community and is impressed and inspired by the College’s communal outreach to the city of Albion, their outreach to the barn and their perseverance to make the College even better. He has high hopes for the western team, and the Equestrian Center staff look forward to seeing the program evolve. D’Agostino encourages anyone to stop by the barn and to say “Hi” to him and his favorite pony, Norman.